The embryo transfer is the final medical step in an IVF treatment cycle. In one sense, this is the climax of the medical treatment, because the embryos represent the end-product of the IVF laboratory. A good IVF clinic, working in sync with a good IVF lab will generate good quality embryos - but once these are transferred into the uterus, then the doctor's role comes to a screeching halt - and nature takes over ! 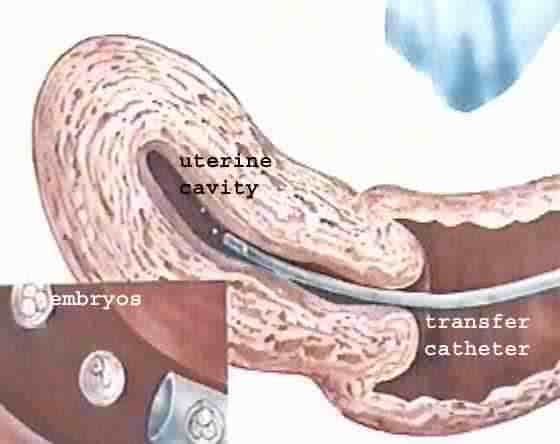 The embryo transfer is a procedure which has always been undervalued and underestimated because it seems so easy and does not entail any surgery. However, I feel that the embryo transfer is the most important step in the entire IVF, because it can make or mar the entire treatment. While it's quite easy to teach a junior how to do an egg collection, the embryo transfer is a difficult skill to master, because it looks so deceptively easy when done by an expert ! Remove as much cervical mucus as possible, preferably with mucus sticks. Sometimes removing too much may cause some bleeding so don't be too enthusiastic! Try not to use a vulsellum or tenaculum. The axis of the uterus should be straightened out preferably with a sponge holder or with the blade of the Cusco's speculum. Gently insert the loaded catheter and wait 1 min to steady your hand. Then plunge the syringe, and then wait again for 1 minute. Most doctors are in a great hurry to finish the transfer, for no good reason ! Ask the patient to breathe slowly, pray or meditate as you do the transfer. Sometimes distracting the patient by talking helps. The doctor should be relaxed too. In fact I recommend that the doctor too should take a few deep breaths before putting the catheter in! The feel that the catheter has gone thru the internal os. I personally prefer the "clinical touch" method to the ultrasound guided option. Many patients find the full bladder which the ultrasound guided technique requires to be uncomfortable - and I do not like looking at the screen when doing a transfer - I prefer focusing on the catheter. The length the catheter is introduced. The catheter should not touch the fundus . If you feel you have touched the fundus, withdraw a little immediately! This is why measuring the uterocervical length is so important when doing a dummy transfer. The Direction the catheter is introduced. The catheter should not touch the walls of the uterus as far as possible. Sometime, if you apply a lot of force, you may feel the catheter is going in, which actually it is kinking and will start recoiling. Please be gentle and patient. Take your time ! What catheter should you use ? Use one which is as soft as possible. I suggest you use one particular brand, so you get used to it, and have a good sense of how it behaves. You should be able to master using this quickly, and this should become your default choice for most transfers. For difficult transfers, you may have to use a special catheter set, with an introducer.